Look What's New on Scorpio's Web Site! Above: At Hluhluwe-Imfolozi reserve, KwaZulu-Natal, SA, November 2012. Middle: The waters in Malaysia and Thailand were seldom very clear. This is the best visibility we found (Koh Lipe). Right: There has been a lot of concern because of piracy lately. On this day 25 years ago, Scorpio was at Mt Hartman Bay, Grenada, West Indies. On this day 20 years ago, Scorpio was at Puerto Alcudia, Mallorca, Spain. On this day 15 years ago, Scorpio was at Fronteras, the Rio Dulce, Guatemala. On this day 10 years ago, Scorpio was at Port Vila, Vanuatu, Pacific Ocean. On this day 5 years ago, Scorpio was at Chaguaramas, Trinidad. This ad was published in All At Sea magazine - Caribbean Issue. Scorpio was sold in January 2015. This web site will not be updated anymore regarding events that have taken place after Scorpio was sold in January 2015. However, we may - from time to time - post logs or articles from the period 1992 - 2014. Here is a summary of a recent (September 2018) interview where Henrik talked about Scorpios circumnavigation. The text is in Finnish, but there are several maps and images. A new sistership has been found. Scorpio has new owners! This site will soon close. As a service to potential buyer candidates we have added photos of some usually hidden spaces. We have made Survey Reports and Specification Details available for download. View some photos from Scorpio's recent launch (opens in new window). More on the subject of corrosion; Read about this project: Seacocks and thru-hulls. This may sink a yacht. We are back aboard Scorpio again. The yacht is still on the hard, but we prepare to launch on October 31. We will now resume updating this web site. We are presently on vacation, away from sailing. Will be back aboard again in October - if Scorpio doesn't get a new owner before that. Scorpio was hauled out at Green Cove Springs Marina, near Jacksonville, Florida, where she will spend the next 6 months. The 2013-14 cruising season is now over. We added a link to Vesselfinder.com above on this page and at the top of the Location page. Now you can always find our latest recorded AIS-position. Remember however, that we do not always turn on the AIS. Our cruising plans for the spring of 2014 have been updated. Our latest report, A Cruise Down Memory Lane, part 1 has been completed. A four page summary of Scorpio's two-year renovation project 2010-12. We updated Scorpio's Photo Gallery. No crocs, frogs or flippers. Our latest report: West Indies Revisited - Cruising Down Memory Lane, part 1. Our plan for the rest of 2013. Do not have too much fun - at least not on my steps. Here is a list of the 60 Finnish circumnavigators. Inside the head of a lifestyle cruiser: Bar of Destruction. We have spotted a new sistership: Dreamtime. Back Aboard, see the Blog. End of summer and, End of Silence. The crew is preparing to return to Scorpio. See the Blog. Scorpio was hauled out on 8 April. The 2012-13 season is over. See the blog. Scorpio arrived in Chaguaramas, Trinidad on 23 March. Our report: Fernando de Noronha, Brazil. Scorpio arrived in Brazil at the island of Fernando de Noronha on 6 March. 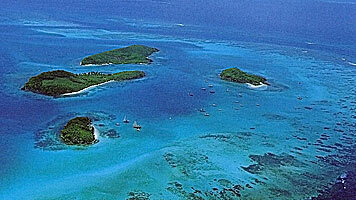 On February 22, Scorpio arrived in Georgetown, Ascension Island, in the South Atlantic Ocean. Our report: The Island of St Helena - The Most Remote Inhabited Place? On February 7, Scorpio arrived in James Bay, St Helena, in the South Atlantic Ocean. Our report: Walvis Bay and Swakopmund - Namibia. Our report: Cape Town - One of the '7 New Wonders of the World'. Our report: Around South Africa - Leaving the Cape of Storms to Starboard. A story: Planning to Sail Around All Continents? - Then Avoid Panama. Our 2013 Master Plan has been updated. A Wine Tour to Stellenbosch, see the blog. The Longest Day - Christmas Memories, see the blog. Note: This post has nothing to do with cruising. Brompton Stupidity - We Refuse to Help You, see the blog. A story: What is a Circumnavigation - Have We Done It Now? Scorpio arrived in Cape Town after a challenging trip. Enough now of sailing for 2012. Our report: Reunion Island - A Very French Place. Cruising Information: Harbours on Reunion Island. September 26th: Scorpio arrived in St. Pierre on the Island of Reunion. Why Do I always Have to Upgrade? Combining Old and New Instruments. Our report: Back in Mauritius - Fending Off in Caudan Marina. September 5, 2012: The crew is back aboard Scorpio in Port Louis. Is Scorpio for Sale? Read more ..
Added some links to weather information for our location. Our Anchorages at Indian Ocean Islands has been updated. Our report: Mauritius, A Melting Pot - Cruisers Exploring Ashore. Our report: Last Passage of the Season - From Chagos to Mauritius. Our latest story: Cyclone Alert - Executive Decisions. Our recent report: Chagos - The Forbidden Archipelago. Scorpio arrived in Port Louis at Mauritius on May 18; The Location has been updated. Our report: Cruising from Male to Gan - Buddy Boating in the Maldives. Our recent story: Tsunami Warning - And Then What? Our photo-report: Maldivian Moments - Male 2012. Our report: Return to The Maldives. Our report: Sri Lanka - The Pearl of the Indian Ocean. Our report: Slow Boat to Sri Lanka. The Future Plans-page has been updated, including thoughts about 2013 and beyond. Our latest story: Planning a Crossing of the Indian Ocean in 2012. Our story: Political Unrest and Routing Decisions. Fuel Is Killing My Outboard - see the Blog. Staying Connected - see the Blog. Our report: Cruising Guide: East of Phuket. Celebrating New Year's Eve at Nai Harn Bay for the third year in a row. Harn bay (if there is not too much swell). The Ark? - Are they preparing for the deluge in Singapore? Getting Proper Screwed - again. Finally: Scorpio is back in the sea. Drawings of the s/s Hermes. This is a pdf-document. Adobe v9 required. The Parking Blues, see the Blog. The Wrong Thing in the Right Place, see the Blog. Strange Rescue at Sea, see the Blog. Disaster Is Just Around the Corner. Our first blog post of the season 2011-12 is not a happy one. The crew is back in Thailand making Scorpio ready for cruising again. It will take one month before splash. Plans and drawings of the Nautor 43. A new Nautor 43 discovery. Replacing the old teak deck: a preview. How much junk do you need living on a yacht: 75 Boxes. See the Blog. The crew flew to Finland for a traditional vacation from sailing during the Scandinavian summer. The Last Night of the 21st Season of Global Cruising. The Neglected Services - Replacing the engine's raw water impeller. True Finns vs. Finland-Swedes (has nothing to do with cruising). The map indicating our track 1992-2011 has been updated. Biggest Change in Cruising in 20 years? Satellite views of our anchorages in the Maldives. Our latest opinion: Why Somali Piracy Has to Stop. Our latest report has been updated with more photos. Our latest report: Against All Odds - Sailing the Wrong Way at the Wrong Time. Our report: Cruising the Maldives - From Uligan to Male. The cost of a Maldivian cruising permit. We arrived in Phuket on April 2, 2011, after a cruise to the Maldives. A report will be posted very soon. We left Male on March 20, 2011; destination: Phuket, Thailand. Warm beer causes death, see the Blog. Notes regarding anchorages and cruising in the Maldives. An opinion: Dumb as a Brick? - To the Med at any Cost. Our story: Cruiser's Paradise Lost? Our latest report: Uligan - One of the Friendliest Places Anywhere. The sequel to Dilemma in the Arabian Sea: A story called Hired Guns and the Shipping of Yachts. Latest blog: Send in Jack Bauer. Our story: Dilemma in the Arabian Sea. Our latest report: From Phuket to the Maldives, making speed records (slow and fast). Our latest BLOG: The Pirates are Winning. Our report: Aboard Scorpio after the renovation. Our report about Scorpio's major refit. We are (were) planning to depart from Thailand on 11.11.11. at 11. See the Location-page. Our report: Boat Projects and Sight-seeing in Phuket. What a waste! Taking a look at rubbish management in the third world, the Blog. The Visa Run. See the Blog. Our Seven Seas. See the Blog. The Year of the Rat? See the Blog. 17 shipyards in 18 years - a way to experience the cultures of the world, see the Blog. Extreme body piercing in Phuket, check the Blog. We added two recently discovered sisterships, and illustrated the raising of Scorpio's water line. The crew is back in Phuket to finish all the work that has been done to make Scorpio look almost like new again. We will be sailing through the Red Sea to the Mediterranean, see new plan and map. World Sauna Championships: Finalist dies, see the Blog. Tropical Finland - a bear market?, check the Blog. Enjoying the Finnish summer: Swamp Soccer World Championships, see the Blog. Earth quake trigger tsunami alert in the Andaman Sea, see the Blog. Recent currency fluctuations increase maintenance costs, see The Blog. We have been charged for 30,000 litres of water, see The Blog. We are finally abandoning Hotmail, see The Blog. Happy Thai New year, see The Blog. Our latest report (in 3 parts): The Full Report from Indochina and Siam. Our road trip in SE Asia is over, have a look at a map of our route in the Blog. Our journey in Indochina and Siam: Check the daily blogs. 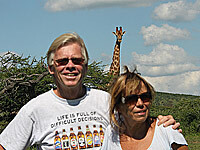 Prices are right, people good and weather perfect - see The Blog. Piracy Alert in the Malacca Straits - see The Blog. The System Protects you. Buying flight tickets on the internet - see The Blog. Recent portraits of the crew! For a time now we have been reminded by fellow cruisers that the photos of Malla and me in the CREW section are shot quite some time ago and we look moore like our children. Well, those shots were only six years old, so what the hell has happened during that time? Anybody else getting older out there? Our latest report: Scorpio Going Tourist and sailing back to Langkawi. Getting properly cheated, see the Blog. Push-in or spinn-on wine corks? The Blog has the answer. We have included the missing report, covering 1997, the first season of this journey. Our recent report includes a trip to James Bond Island. Shopping in the Islands? Yes, at least in Thailand, see the Blog. Waiting for our report from James Bond Island? Here is a preview in the Blog-section. Our report: Christmas in Thailand. Our report: Cruising around Langkawi island. Update of our llist of our anchorages in South East Asia. Our latest video: The orang-utans of Borneo. A video from the previous millennium: Fishing Nuns. Our report: From Singapore to Langkawi. Our report: The Singpore Sling. Our report: From Bali to Singapore, incl. a visit to the orang-utans of Borneo. A recent video: The graceful Legong dances of Bali. A video: The Shadow Puppet show. Our report: Culture in Bali. The video: Children singing "Indonesia". Our report: from the Banda Sea to Bali. Our first report from Indonesia: From Darwin to the Spice Islands. A Search Engine for this web site added to the Home Page. An interactive (Google) map of our possible anchorages in Indonesia. Our report: From Cape York to Darwin. Our plans for the next 6-18 months have been updated. We have started with some entries in the Blog Section. There is also a link to the Blog from the Home Page and one from the Log & Yarns page. Our report: Back to the Tropics, inside the Great Barrier Reef to Cape York. People often ask, why we fly to Finland every Nordic summer, here's why!. Our report: Northbound from Sydney, dodging cyclones. More of the earlier years: Our journey to the Centre of the Earth in 1998. Project: Installation of a bow thruster, in response to a letter from an other Nautor 43 owner. The earlier years: Cruising on the Costa del Sol in Spain in 1999. A new video: Rush hour in Sydney Harbour. A smaller version of this video is also bedded into the Home Page. The Location has been updated, and our route around Australia decided. We have started playing with an intro for the site. Back in time: Report of our return from Europe to the West Indies in 2000. An automatic slide show of the New Year's Eve fireworks in Sydney. The section about the steamer Hermes is updated. Our report: The World's Greatest Fireworks: New Year's Eve in Sydney Harbour. We have included a bit about Tom Neale, the hermit of Suwarrow, as an example of a good story. Our video: Entering Sydney Harbour. Our report: From Bundaberg to Sydney. People often ask why we fly all the way to Finland every Nordic summer. We decided to share some photographic views instead of verbal explanations. Look HERE. We decided to trash the "Guestbook" section because of a lot of junk mail (spam). New page design of this site. It will be applied to new pages and gradually older pages will also be converted. A follow-up: The final repair of the corrosion around the gooseneck. A new video: Our new Booby pet. An new video: A fuel transfer between yachts in the Coral Sea. An other new video: The Slave Boys is the name of the string band on Urepurapura island. A slide show: Traditional "kastom" dance in Vanuatu. In the How To Series: Installing of a second autopilot on the steering quadrant. Repairs in the Tropics never end: Corrosion at the mast - a potential disaster. Our report: From Fiji to Vanuatu. Our Future plans are updated. We have started to develop a "mash up" Google map section, and the first result is an INTERACTIVE map of our trail in New Zealand. lIn the future these Google Maps will be found on the Maps Index page. Videos: This is Sailing, and This is Sailing Too. Our report: Cruising in Fiji. Our report: Sailing from New Zealand to Fiji. A new feature: A flash viewer component experiment for slide shows. Here's the first. And here's the second. We included a new section, The Press Room, now that there's been more than one article about Scorpio. Our report: Change of Plans, And a Trip to the South Island. Video: Tandem jump off the Kawarau Bridge. 3 New Slideshows from Past Years. You can access them via the Slide Shows Index Page. Our rough plan for the coming season is updated. A Big Sister is added to the Sisterships Page. Our report: People in a port. Repair and Development accounts: Keeping the bilge clean. When did you last check the condition of your mast step? Our report: Honeymoon Down Under. "A true story"
The photo of sister ship Baltic Girl has been added. Our report: From Tonga to New Zealand. Our report from the Kingdom of Tonga. Our report: From Bora Bora to Suwarrow and Samoa. Cruising is boat repair in Exotic Places: The Freezer Blues. An addition to "The Stories" section. This is a story about something that broke down a couple of years ago. The Location has been updated after our return to Scorpio in Raiatea. Our first report from the Society Islands. Our first report French Polynesia. TIP: For a view of our photos i random order, try Google Pictures and type "Scorpiosail" in the search field. Our second report from Galapagos. Our first report from the Galapagos Islands. Video clips from the Galapagos of iguanas and sea lions. For our Finnish friends: A story about our cruises in Cuba (in Finnish). Our report from Bahia de Caraques. Our report on the crew's return to La Libertad. The Maps section is updated with the maps showing our tracks from 1997. Our two latest reports: The transit of the Panama Canal and From Panama to Ecuador. Our report: Colombia to Panama. Our report: Port Antonio, Jamaica, to Cartagena, Colombia. 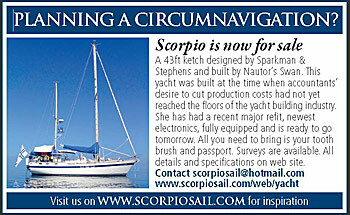 There is now a quick link to our latest report on the opening page (www.scorpiosail.com) and on the Home Page. The LOCATION is updated. New cruising plans! Remember also to check the INDEX of our month to month progress, thats the way to our most recent reports and photos. Our report of the 2004 autumn: "From the Chesapeake Bay to Varadero, Cuba". SCORPIO's LAW is adapted from our frequent stowaway, Mr. Murphy. We have found that nature and things indeed have a conformity to law. You can compare our thesis with your own via the links in the YACHT section. THE GALLERY is finally open. We are particularly proud to display photos of the Maya Indians of Guatemala, courtesy of Mecca Mantz. REPAIRS & MAINTENANCE & DEVELOPMENT are constantly the order of the day. We have a new page in the YACHT section dealing with this subject. It is really not as boring as it may sound. There are going to be some hopefully entertaining horror stories about failed repairs etc. The first records are about our preparations for launch this September 2004 and how it pays to use your creativity. Browsing is recommended also for the not so technically minded. This web site replaced our old site in September 2003. The old site will remain on the web for a while, but will no longer be updated or revised. The first version of the old site was established in 1996, when Note Pad still was an essential tool in web design. We have thereafter used mainly Microsoft's Front Page's different versions to create and maintain the present site. A whole new Scorpio Web Site is introduced; the address is www.scorpiosail.com. Merry Christmas links to a Christmas Card from the Crew. After several new entries in the Log Book section, it now covers our movements starting on Autumn 2002, with many photos. The yacht's communications & entertainment system has been considerably upgraded. An introduction in Swedish and in Finnish. The Welcome Page was been renewed. The previous entrance was through the BLACK HOLE. THE LOG & YARNS section is finally getting some entries! Here you can follow our journey more closely. There is also a map, showing our journey from Beaufort to the Chesapeake Bay. Previous versions of "The Location" page have been compiled to the new PREVIOUS LOCATIONS. We have arrived at our destination = moved aboard in August 2000. The appropriate changes have been made to THE CREW and THE LOCATION. As the previous revision (below) tells, we really are serious. Our home in Finland is now sold. Presently we are actually in a state of shock! We have to move out before the end of July! How can you suddenly get rid of all the things that you have collected during the past 50 years? This Site can now be entered through a BLACK HOLE, inspired by David Siegel, author of The Killer Web Sites. Drawings by Christofer are on display in THE GALLERY . A SEARCH ENGINE to find items of This Site. Try for instance the word "caribbean" . A map showing our (potential) future cruising directions. A Log and Stories section. The first story, From Grenada via Venezuela to the ABC Islands is, however, in Swedish only. The area previously called The Cruise has been replaced by THE OBJECTIVE. It includes a word from the Captain who saw reason to explain why This Web Site exists! commanded by Scorpio's captain's ancestor. The story may also be of general interest. Scorpio's temporary home port has changed from the Mallorca to the Costa del Sol. We have added this page: WHAT'S NEW!